The majority of LUCOBIT products is based on ethylene butyl acrylate copolymer (EBA). 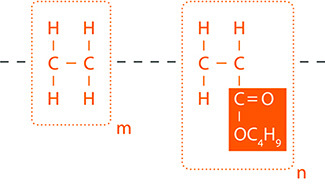 The repeat unit of EBA copolymers is shown in the figure. This structure explains many of its unique properties as explained on the next pages.